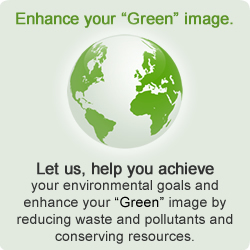 American rail companies are leading the charge in environmental initiatives across the transportation industry and we are happy to help them achieve their aggressive environmental and recycling goals. 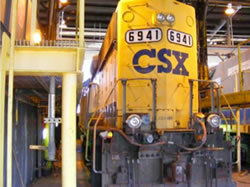 Locomotives and railcars must be kept clean for a variety of operational, image, and safety issues. To match the locomotives we are cleaning, Wash Bay Solutions provides heavy- duty washing systems that are meant to last for a long time. Depending on the operation, locomotives can be cleaned by both pressure washers or large wash systems. The inline flow regulator on our heavy-duty pressure washers allows the operator to vary the flow rate and corresponding pressure at the wand which provides tremendous flexibility when cleaning different equipment and surfaces. It also provides a 15-20% increase in washing efficiency compared to a standard system which is especially significant when personnel are cleaning large areas. 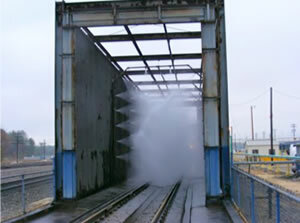 Washbaysolutions also designs and builds custom locomotive wash arch systems. Designed around the locomotive operations, these systems can include engineered 360° coverage for wetting, soaping and rinsing, stainless steel components, and automatic controls for all safety and operational concerns. We can build new locomotive washes or retro-fit existing washes to meet modern environmental, conservation, and safety standards. As part of the total systems, Washbaysolutions can incorporate closed- loop reclaim systems to capture, treat, store, and deliver clean recycled water to the pressure washers. If sewer connections are available, our sewer discharge systems treat the processed water before it is discharged to the sewer.